fnmCan someone help me update grape's version of m0rehud? Essentially the hud doesn't work, and I want the specific crosshairs that he has in there + the actual version of m0rehud. [quote=fnm]Can someone help me update grape's version of m0rehud? probably been asked before, but how can I remove the [unknown] text that comes up when i'm inspecting someone's weapons, as shown in this screenshot? probably been asked before, but how can I remove the [unknown] text that comes up when i'm inspecting someone's weapons, as shown in [url=https://gyazo.com/8a0bd6559e74e669aa94e0ce3d9ccad7]this screenshot[/url]? I gave a list of the things I disabled in that file already, and the only other two elements listed in that file were already set to enabled = 0. Forcing it to render off screen doesn't fix the issues though, I've already tried it. Konceptprobably been asked before, but how can I remove the [unknown] text that comes up when i'm inspecting someone's weapons, as shown in this screenshot? itempanel containse an obsolete attriblabel in Spectator(Tournament).res and possibly still in HudInspectPanel.res, simply remove it, and while you're at it, add 1 line to the itemmodalpanel to get high quality item images. itempanel containse an obsolete [b]attriblabel[/b] in [i]Spectator(Tournament).res[/i] and possibly still in [i]HudInspectPanel.res[/i], simply remove it, and while you're at it, add 1 line to the [i]itemmodalpanel[/i] to get [url=http://rebelconquer.net/25428/higher-quality-item-images-in-inventory-loadouts]high quality item images[/url]. How do I change TargetID health numbers to blue when they're overhealed? HamHeadHow do I change TargetID health numbers to blue when they're overhealed? inside your hudanimations file, look for "event HudHealthBonusPulse"
Also be sure that within another event, "HudHealthBonusPulseStop ", that you have the PlayerStatusHealthValueSpec field return to the original color that it was. [quote=HamHead]How do I change TargetID health numbers to blue when they're overhealed? 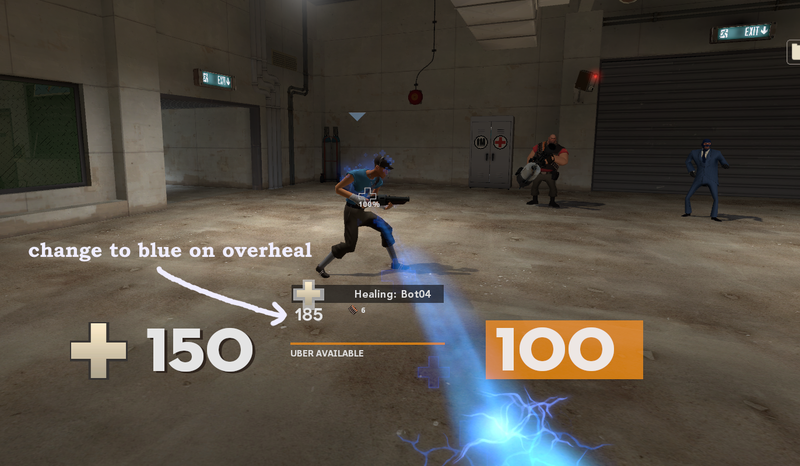 In resource/ui/hudplayerhealth.res search for "healthdeathwarning" and change the number next to it to "0.49"
I was looking through different sourcescheme files from different huds and comparing them to each other to try and work out what everything does. I noticed that they have different definitions in them with the stock hud having the least. Is there any way to find out all of these or is it just guess and check? Where is the ready up timer located for match making? duck_Where is the ready up timer located for match making? Its one of the first few entries in hudmatchstatus. XenThePybroI was looking through different sourcescheme files from different huds and comparing them to each other to try and work out what everything does. I noticed that they have different definitions in them with the stock hud having the least. Is there any way to find out all of these or is it just guess and check? XenThePybro duck_Where is the ready up timer located for match making? duck_ XenThePybro duck_Where is the ready up timer located for match making? There is also a lot of places in hudanimations that its screwed with. while editing my scoreboard, I noticed there were some fields that ended in "_lodef" and "_hidef", what do these do exactly, and do I really need these values in my hud? Konceptwhile editing my scoreboard, I noticed there were some fields that ended in "_lodef" and "_hidef", what do these do exactly, and do I really need these values in my hud? I googled this a few months ago and no one really knows. It might have something to do with super low or high resolutions though. If your monitor is high enough you can try it but there is nothing you break by removing them. How do i make the back ground for the loadout panel to cover the whole screen? uniqlyHow do i make the back ground for the loadout panel to cover the whole screen? [quote=uniqly]How do i make the back ground for the loadout panel to cover the whole screen? Too bad there's no way to search in this thread quickly bc I'm sure this has been asked before but I can't remove the kills from the scoreboard in m0rehud. I'm pretty sure by now that it's not in the scoreboard.res file. Does anyone know where else it could be? ShpeeismeToo bad there's no way to search in this thread quickly bc I'm sure this has been asked before but I can't remove the kills from the scoreboard in m0rehud. I'm pretty sure by now that it's not in the scoreboard.res file. Does anyone know where else it could be? How does one edit the individual elements on the PLR HUD, in a similar fashion to the PL HUD? How does one alter the "Loading..." indicator and it's background when starting the game (couldn't get a proper screenshot)?